For all of you who have been to a Microsoft Tech.Day or TechEd event you'll be familiar with the format. A series of presentations throughout the day, organised into relevant groupings, on various Microsoft technologies and including a scattering of guest speakers from industry. You'll commonly find that there are no new announcements made at these events, though they are used to promote new and forthcoming products that have already been announced. The speakers will also be helping you get more out of the technologies you already have, or are planning to deploy, and some provide in-depth tutorials in their seminars. This week is Microsoft UK's Tech.Days which are taking place in London. I was aksed by Microsoft if I could be around on the first day, Monday, to help out and be on hand to answer questions from delegates. Of course, I was happy to help out. This gives you a different view of the Tech.Days as you get to see the event unfold behind the scenes, and you get a good insight into not only the organisation that goes on but also how such events are structured by the copmpany. Here, I thought I'd give you a little insight into what goes into making a successful Microsoft tech event. Timekeeping is everything! Everybody knows that speakers can and frequently do run over time. 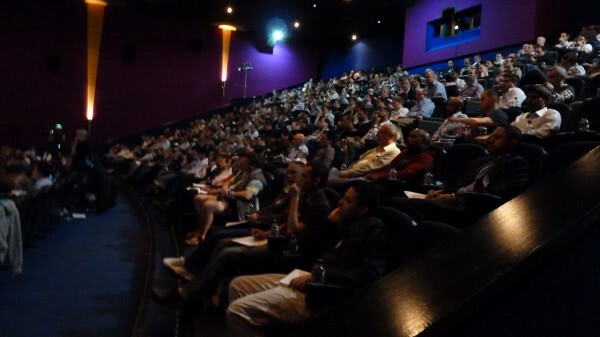 Microsoft staff are on hand during every seminar and talk to give speakers cues when they're running out of time. So why do they do this? Well you might think that it's because you have a lot of speakers during the day (there were about 12 on Monday) and some people might not have time for their talk or might have to cut their talks short. While there will obviously be an element of this I became aware that the strict timings on sessions had more to do with keeping the delegates happy. With sessions running at around an hour and half, that's a lot of information to take in and a lot of time to be sat listening to speakers. Microsoft made sure that people had plenty of opportunities for breaks and always had tea, coffee and drinks available, and plenty of them too. There was even free popcorn (this Tech.Day was held in a new multiplex cinema). The location is important, it has to be easy to get to, have plenty of facilities available and be pleasant and comfortable. This venue had all three with an underground station, supermarket, restaurants and bar in the same building, a good choice I thought. 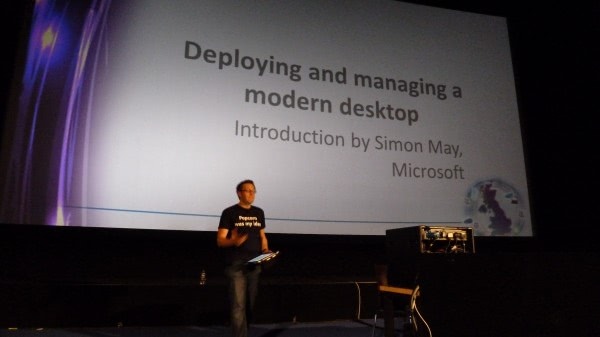 As for the organisers themselves, the event was mainly put together and hosted by IT Pro Evangelist Simon May. It's a small team of people at the top of the tree at these events making sure that everything runs smoothly. For a company like Microsoft I was actually surprised by how few people were involved in the actual organising. There were plenty of Microsoft staffers there are a few MVPs like myself to help out but it was clear that all the Microsoft staff had been well briefed the day before about their individual roles. On the day itself everyone knew exactly what they had to do and when and, consequently, the day ran like a well-oiled machine. On this particular day there were guest speakers from the British Airports Authority, the Co-Operative and the Bank of Ireland where the head of IT is also an MVP. Most people I spoke to agreed that they had definitely taken away from the event knowledge that they hadn't had before about products they already used or knew about. I'd say that the Microsoft Tech Events are a very useful thing to attend if you can spare the time. You paint an fascinating picture of the event in London, Mike. I agree if anyone has a chance to catch one of these they should. I would have loved to attend this one if I was anywhere near at the time. which was particularly easy for me living in Manhattan. It was an all day affair for IT Pros and quite informative. and yes, they all notoriously seemed to run pass allotted time. As a bonus everyone received a free copy of Windows 7 Ultimate. Generous indeed and much appreciated by all who attended.